President of the AVA's special interest group in birds, Dr Alex Rosenwax, said that now is the time of year when veterinarians see birds suffering from heavy metal poisoning and other injuries sustained by eating parts of toys given to them for Christmas. "Lead, zinc or copper poisoning is one of the most common problems I see at our bird and exotics clinic," Dr Rosenwax said. "Many birds like bells and metal chains, but the galvanized and copper bells and chains are toxic if the birds lick or chew them. Painted toys and metal keys are also often toxic. Unfortunately, many parrots seem to find them quite tasty. "This becomes a particular problem when the items rust as it becomes easier for the birds to chew off the oxidised metal. I normally recommend against metal toys, but if they must be used, make sure they are non-toxic and changed prior to them showing any signs of rust," he said. Dr Rosenwax said he has also seen numerous cases lately of birds suffering from blockages after chewing on rope toys or perches, where tassels have become lodged in their stomachs or throats. "Many of our bird owners are worried about plastic. 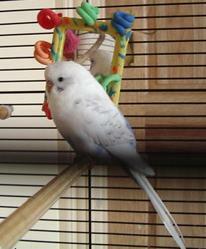 However, most hard, unpainted plastic ladders and balls are fine to use in cages. The problems come if the plastic toys such as balls have metal bells inside. Many parrots will eventually split the plastic ball open and chew on the metal insert. Mirrors are generally okay, but the old fashioned mirrors with lead edges are poisonous. "Plastic milk container tops are also usually safe and many birds love to play with them. Many newer toys are wood painted with vegetable dyes. Providing the wood has had no chemical treatment, these are generally safer to use."